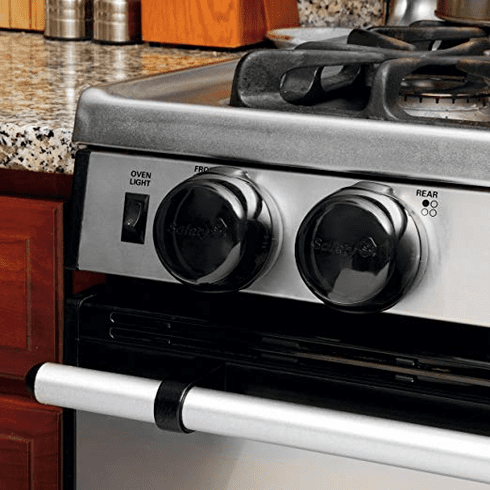 Help keep your stove knobs off-limits with Black Decor Stove Knob Covers from Safety 1st. Young children love to explore and find knobs fascinating. These child-proof, stove knob covers help protect curious minds from danger while parents aren't looking. A hinged lid allows for easy adult access when needed while the tinted plastic coloring knobs blend with home décor. Each knob is made from durable, heat-resistant plastic to resist wear and hold up to repeated use. Fits any standard size stove knob up to 2-5/8" in diameter and 1-3/4" high, that can be removed for the installation of the knob covers and convenience during cooking. The knob covers cannot be used on recessed knobs. Tested for safety and durability. No drill installation.